The 1st SC was converted into Sharpshooter regiment in early March of 2014 from the 1st North Carolina Cavalry. This conversion was done to allow DA fight Union Sharpshooters more effectively in linebattles. Our goal in the 1st SC Rifles is to provide a friendly and fun environment to anyone who wants to experience organised linebattles as a Confederate Sharpshooter. We are always recruiting so feel free to contact either Colonel Lucas or Staff Captain Highlander to join us. 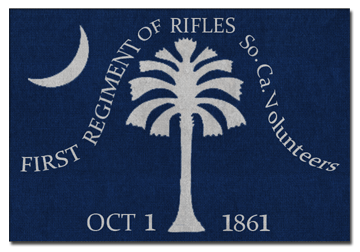 1st South Carolina Rifles is a regiment in the Old Brigade of the Dixieland Army. 1st Regiment Rifles, known as Orr's Rifles, was organized at Sandy Springs, South Carolina in July, 1861. Its members were recruited in the counties of Abbeville, Pickens, Anderson, and Marion. The unit was first stationed on Sullivan's Island and called by the other troops "The Pound Cake Regiment" because of its light duty. Then in April, 1862, it moved to Virginia with 1,000 men. Assigned to General Gregg's and McGowan's Brigade, it fought with the army from the Seven Days' Battles to Cold Harbor. Later the regiment endured the hardships of the Petersburg trenches and the Appomattox operations. Of the 537 engaged at Gaines' Mill, fifty-nine percent were killed, wounded or missing. The unit reported 116 casualties at Second Manassas and 170 at Fredericksburg, then lost forty-nine percent of the 233 at Chancellorsville and three percent of the 366 at Gettysburg. There were 12 killed and 81 wounded at The Wilderness, 15 killed, 36 wounded, and 44 missing at Spotsylvania, 3 killed and 34 wounded at Deep Bottom, and 9 killed and 37 wounded at Poplar Springs Church. It surrendered 9 officers and 148 men. It's commanding officers were James L. Orr; J.F. Marshall; D.A. Ledbetter; J.W. Livingston; J.M. Perrin; F.E. Harrison; William M. Haddin; G.M. Miller; and J.T. Robertson. Simply reply in this thread with the following information and we will get back to you asap! To glory he´ll lead us. And ready to fight with him. Our Lord Emperor on his Golden Throne. To advance good old Dixielands flag. Cause our duty is to fight and die. And the 26thNC at our side. Leading his battle brothers into the fight. Cause he leads the Old Brigade truly wise”. That’s Reznovs lot, with their dirty beards. leading his Brigade into the slaughterhouse of war. The Forgotten Community and its regiments are proud to present our new server Forgotten_Honor_AZW for public play of the Anglo-Zulu War mod. It is a 200 slot server and can be booked by the community for events if needed. It should be running as a public server most days!. At the moment it is running Public 24/7 except for the below times! Tuesdays 1700-2200 GMT (BST when applicable) Server is Down for Tuesday North and South Linebattle. Thursdays 1300-1500 GMT (BST when applicable) Server is Down for Maintenance. Saturdays 1930-2330 GMT (BST when applicable) Server Down for Saturday Night North and South Linebattle. No Recruiting - Only Forgotten Honor sponsored Regiments may recruit on the Forgotten Honor Servers. No playing as Zulu's unless it is a specified event. No intentional teamkilling. If however you intentionally stand infront of a loaded cannon, then tough luck if you die. Do not attempt to glitch the bot's out IE by placing a dirt wall in a doorway so they cant ever get to you. "Forgotten Honor organizes online events for gamers. Our credo is "for gamers, by gamers". Please bear in mind that due to the Forgotten Honor website and forums, the regiment asks that everyone who enlists join the Forgotten Honor community website. The benefits include ranks, awards and medals, better communication and organization as well opportunities for you to play pretty much any game with friendly faces! A Quick Guide on how to join. Step 1 Become a member. - Click on Register on the top left corner. - Read the Forum Rules. Step 2 Signup for a Campaign / Regiment. - Scroll dawn till you see Mount & Blade Warband - Napoleonic Wars. - Click Prussia and then click Start Registration. - If all thats finished you will receive a Private Messages with a welcoming, rules, and forum link. If something still isnt clear contact us on steam and we help you out. Hello there we are the 11th North Devonshire Regiment of Foot, a mix of NW and N&S players who play together as the NR24 and the 5th Texas and who have only recently become aware of this great mod. We are here to blow off steam, have fun, and try to survive whilst killing as many Zulu's as possible in the name of defending our British Empire! First raised in 1667 by the Marquess of Worcester Henry Somerset it was reorganized into the 11th Regiment of Foot in 1751 and given the North Devonshire title in 1752. During the Napoleonic Wars it saw a lot of action in the penisular campaign and elsewhere. http://www.victrixlimited.com/downloads/Victrix%20Regiments%2011th%20Foot.pdf However, the 11th were heavily engaged at the battle of Salamanca and it was here that the regiment earned its sobriquet “The Bloody Eleventh”. For its bravery and fortitude during the battle the regiment was awarded the battle honour “Salamanca”. Following the defeat of Napoleon, the regiment spent most of the 19th Century on garrison duty throughout the Empire. It took part in the Tirah Campaign in 1897-1898 and the Second Boer War from 1899 to 1902. The 2nd Battalion was re-formed in 1858 and fought in the Second Anglo-Afghan War, the Ashanti Wars and the Second Boer War. We will be playing primarily as a Line Infantry regiment with sapper support, however if we get enough members we will also field a unit of Riflemen, Artillery or Cavalry - in that order. We are here to have fun and play a game. We will not be heavy on discipline, orders or anything that would counter the "funability" aspect of the game. Do expect however to die often, and to hear the death cries in our teamspeak server as we laugh at not having enough ammunition or defence forts built! Teamspeak 3 is a requirement, it increases the fun of gaming by a factor of at least 100%. Are we aware that the 11th wasnt in the Zulu War? : Yes. At the time I believe the 2nd Battlion was busy elsewhere in the Empire. However it could have just as easily been in the Zulu War. Or rather, it is feasible. Besides, there are dozens of other regiments in the various mods of M&B that are not just impossible, but are so impossible its like going to a Roman Toga Party dressed in a Bumblebee Onesie. At least with the 11th it would be like going but dressed in the wrong era toga. Will there be training/other possible boring stuff? : Yes. We will have training. Its called going onto the max population server and killing zulu's whilst trying various tactics. Or as we like to call it until the game is actually released and not in alpha/beta: Playing Regular. Will there be line battle events etc? : We hope so. We would love to see some organized play, and love to be part of it! Is this just to have fun? : Pretty much. Where do I sign up? : Either the steam group, or contact me at Ser Lucas Avis on steam. Or the FH Teamspeak. Or post below!